With drive, resilience and passion Green People was founded in West Sussex in 1997. From the very beginning, product performance and ethical practice were never sacrificed for profit. With a promise to never use aggressive ingredients or synthetic chemicals such as sodium lauryl sulphate (SLS), parabens, phthalates, petrochemicals, alcohol (ethanol) or synthetic fragrances or colourants in our products, Green People has grown into a major brand. 15 years on, with a wealth of knowledge and experience Green People offer more than 100 organic products in high performance award-winning ranges for all of the family including specialist skin conditions. The products are packed with over 90% active natural and organic ingredients to protect, nourish, balance and, most importantly, respect your body. 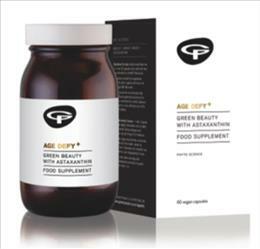 Seagreens is a key ingredient in Green People's latest 'Age Defy' product for its nutritional, detoxing and rejuvenating qualities. Available in health food stores and online.